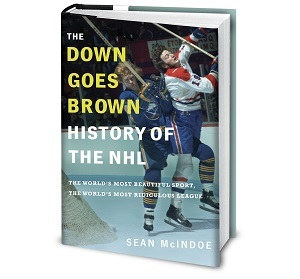 Down Goes Brown: Have we seen this before? - The Leafs beat the Wings in overtime, thanks to their European forward tipping in a low point shot from the pinching defenceman. I could swear this reminds me of something, but I can't quite put my finger on it. Any Red Wing fans want to help jog my memory? - Linesman Pat Dapuzzo getting kicked in the face, suffering a broken jaw and 60-stitch cut, and then shoving the ref out of his way to go break up a fight was the most badass thing I've seen all year. The NHL should use that clip in their advertising.